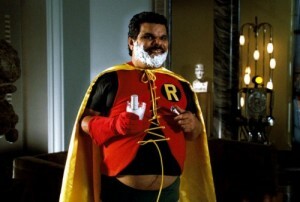 ‘Black Dynamite’ Director Scott Sanders Will Direct Luis Guzman in ‘Aztec Warrior’!!! Black Dynamite director Scott Sanders is going from blaxploitation to luchador-ploitation with Aztec Warrior. I don’t know much about this project but according to the good folks over at Twitch, Luis Guzman will play the Aztec Warrior. Sanders said that principal photography will be begin today and will co-star Terry Crews. Like I said above, I don’t know much about this film, but judging from the concept art and the fact that Sanders has hired a pretty big visual FX house to provide the special FX, I think it’s safe to say, we will be getting one hell of a fun film. Going by that concept art, I think we might be getting a luchador fighting monsters and robots. Robots that look like Ed-209. The FX company is Aparato which did the viral video Panic Attack, which launched Fede Alvarez’s career. Alvarez is currently directing the remake of Evil Dead. This looks awesome. Your thoughts? ‘Evil Dead’s’ Fede Alvarez Will Take On ‘Dante’s Inferno’!! This entry was posted on Monday, July 9th, 2012 at 6:26 pm	and is filed under Film, News. You can follow any responses to this entry through the RSS 2.0 feed. You can skip to the end and leave a response. Pinging is currently not allowed. « ‘The Dark Knight Rises’ Reveals Synopsis, Dialogue, Interviews, and More!! !